[ Applicable Model ]: For Shark Rotator Powered Lift-Away NV755 & UV795 models only. [ Helpful Tips ] : Remember to clean your filters regularly under normal use. Also, for optimal performance, tap clean filters between washes will be better . 3, No suction or light suction. Step 2 : Rinse the filters thoroughly in water until the water runs clear. Hand wash only . Step 4 : Let air dry completely for at least 24 hours before replacing. To insert the felt filter in first, then add the foam filter. Step 2 : Rinse under water. Spraying the filter with the water until it is completely clear and clean. Step 3 : Let the filter to air-dry completely for 24 hours. Step 4 : Replace the dry hepa filter into the vacuum , and swinging the door securely closed until it clicks into place. This is not a Shark OEM product and is not covered under any Shark manufacturer's warranty. The Shark brand names and logos are the registered trademarks of their respective owners. Any use of the Shark brand name or model designation for this product is made solely for purposes of demonstrating compatibility. 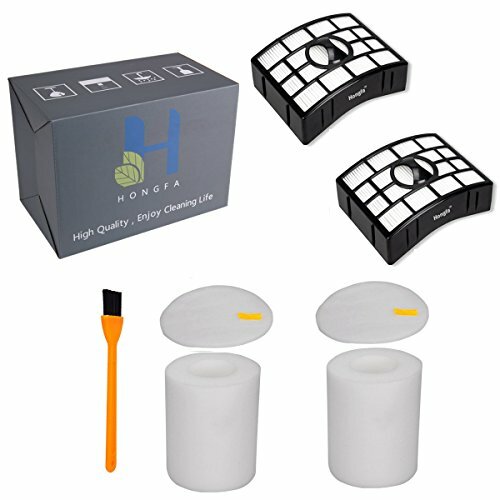 HongFa Electric Shop is a professional brand that research and develop intelligent cleaner and traditional vacuum cleaner accessories. Shark nv755 Filter Features : Remove household dirt and dust to improve indoor air quality, traps dust and allergens inside the vacuum easily .Shark filter for efficient filtration of dust and allergens. Shark NV755 Filter Washable & Reusable : Simply rinse with clean water and let it completely air dry before reusing them . We recommend changing every six months. If you have any questions about this product by Hongfa, contact us by completing and submitting the form below. If you are looking for a specif part number, please include it with your message. FilterBuy Shark XHF450 HEPA Compatible Replacement Filter. Designed by FilterBuy to fit Shark Rotator Professional & Shark Rocket Professional Upright Vacuum Cleaners.